Bike Ride America for Safe Routes comes to Jax this February! Get ready for it, Jacksonville! 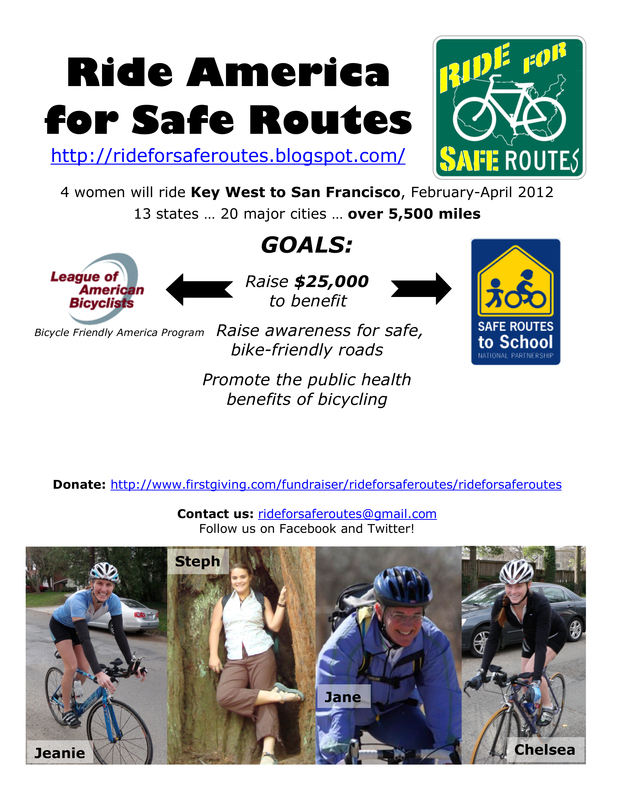 Four women will ride from Key West to San Francisco, February-April 2012, hitting 13 states, stopping at 20 major cities, and covering over 5,500 miles with just two wheels and sheer pedal power. They expect to arrive in Jacksonville on Wednesday, February 15th 2012, and they want to ride with you! Come on Duval cyclists! Let’s make this a memorable occasion for the entire city by having a large group ride with these four daring women, with local media present too! Promote the public health benefits of bicycling.